A couple of Travis’ friends from the mainland are touring the Big Island as they stay at hotel Travis. Catherine and Brian are from the DC area. Travis, being ever resourceful, saw the bartender putting together a drink for someone and decided to order a few of them. The mojito is a popular Cuban drink. Pretty refreshing and we had a few. We were at Huggos On The Rocks tonight. 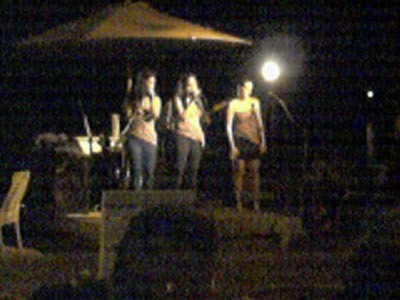 I know this looks pretty fuzzy but it’s a cellphone photo of ‘Hot Lava’ a trio of local gals who perform Motown hits along with other tunes. 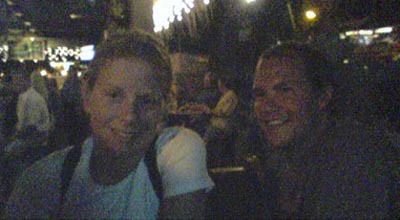 Sorry for the quality of the image but my Nikon CoolPix is going in the shop for some repairs.